Looking for a great domestic holiday that everyone can enjoy? The Gold Coast makes for the perfect holiday with its great weather, beautiful beaches, exciting food and drink scene, and many different activities. A trip to the Gold Coast can be expensive, but did you know that Webjet offers Gold Coast package deals to help you save money? These Gold Coast packages allow you to bundle together your flights and hotel to save big. Rather than spending extra money on flights and accommodation, you can put it toward all the exciting activities and experiences that are waiting for you. Gold Coast family holiday packages and Gold Coast theme park packages are perfect for families looking to take a trip. No matter what your travel plans, Webjet has holiday packages Gold Coast that are perfect for you. Are you interested to learn more about Webjet’s Gold Coast package deals? Keep on reading to see why Gold Coast holiday packages make for the perfect domestic getaway. The Gold Coast is located about 80 km south of Brisbane and is a great spot for Aussie travellers who want a relaxing, sunny holiday without having to go too far. While it’s possible to fly into Brisbane and get transport to the Gold Coast, the Gold Coast also has its own airport. Gold Coast Airport (OOL) is located on the southern end of the Gold Coast right on the border of New South Wales. As one of the top holiday destinations in the country, you can easily catch a flight to the Gold Coast from every major city in Australia. Virgin Australia, Qantas, Jetstar, and Tigerair all have daily flights to the Gold Coast from many airports around the country. Travelling from Melbourne, Sydney, Cairns, Perth, Adelaide, or Canberra, you can get a direct flight. Even if you book Gold Coast holiday packages from another airport, you will only have a short stopover. Due to its great location, a flight to the Gold Coast is quick. Flying from Sydney, you’ll get to the Gold Coast in 1 hour 20 minutes. From Melbourne, you’ll fly for 2 hours. And even flying from Perth, you can be relaxing on the Gold Coast in just 4 hours 30 minutes. Once you’ve landed, there is a SkyBus Airport Shuttle that makes stops in the main tourist spots of the Gold Coast. You can also catch the 777 bus that makes several stops between the airport and Broadbeach. From there, you can catch a tram into Surfers Paradise. For the most freedom to explore the area during holiday packages Gold coast, you may want to rent a car. There are several rental car companies available right at the airport. Where can you stay with Webjet’s Gold Coast Package Deals? The Gold Coast is made up of many neighbourhoods, each offering a different experience on Gold Coast holiday packages. Surfers Paradise is the centre of the Gold Coast with lots of restaurants, shopping, and nightlife. It’s mostly made up of skyscrapers, which offer amazing views over the city and ocean. Broadbeach is located just south of Surfers Paradise, but is much more quiet and calm. It has a great beach of its own, and you can easily walk into the centre of Surfers Paradise in about 30 minutes. 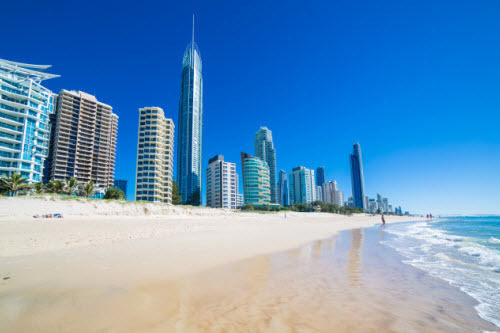 Located near the airport, Coolangatta has a long boardwalk full of great restaurants, a nice beach, and a view of the Surfers Paradise skyscrapers. Another popular neighbourhood is Burleigh Heads, which is known for its laid-back vibe, great cafes, and beautiful coastal area. Here are some of the area’s top hotels to get you started with Gold Coast family holiday packages. If you’re hoping to stay right in the middle of all the action, the Rhapsody Resort is the perfect spot. It’s located just steps from the beach and is a quick walk into the heart of Surfers Paradise. Like many resorts and hotels in the Gold Coast, Rhapsody is made up of apartments. Guests can choose between studio, one bedroom, and two bedroom apartments. All rooms have floor to ceiling windows to maximise the great views of the ocean and the city. Resort facilities include a swimming pool, gym, rooftop gardens, and a barbecue terrace. Located a quick tram ride from the centre of Surfers Paradise, Bel Air on Broadbeach is a great place to stay. The hotel is made up of one, two, and three bedroom apartments with both value and luxury options available. From Bel Air, you can walk to the beach or Pacific Fair Shopping Centre in minutes. The Broadbeach neighbourhood has some great restaurants and a relaxed atmosphere. Facilities of Bel Air on Broadbeach include a spa, indoor and outdoor pools, a gym, and a barbecue area. If you are travelling to the Gold Coast with young kids, the Sea World Resort could be the perfect option to please everyone. The resort offers a variety of rooms and suites that are perfect for Gold Coast family holiday packages. And with its location inside SeaWorld, you have easy access to the theme park. The resort has a lagoon pool and a SpongeBob SplashBash water playground that kids love. There is also a kids club with lots of activities for the young ones, including organised sports and games, a movie theatre, and video games. Parents can join in on activities or drop the kids off at kids club while they enjoy a quiet afternoon or evening to themselves. The Boardwalk is a brand new hotel in the heart of Burleigh Heads. It’s in a perfect location right across from the beach and a quick walk to the neighbourhood’s eclectic bars, restaurants, and shops. The hotel is made up of one, two, and three bedroom apartments. Many of the rooms have an ocean view, and all have a balcony with outdoor seating. The hotel is surrounded by tropical gardens that help give the resort a serene atmosphere. Facilities available with Gold Coast package deals include a swimming pool, gym, spa, barbecue area, and yoga terrace. Nirvana By The Sea has a quiet and secluded feel to it, but is still close to everything in Coolangatta. It’s just steps away from Kirra Beach and is a ten minute walk to the main stretch of town full of restaurants, cafes, shopping, and bars. It’s also conveniently located just five minutes away from the airport. The resort has a modern design and offers one, two, and three bedroom apartments with floor to ceiling windows. Many have ocean views and a balcony, and some even have their own private pool. Open to all resort guests is a heated pool overlooking Coolangatta, a separate childrens’ pool, a spa, barbecue area, theatre room, gym, and more. Located about an hour south of Brisbane, the Gold Coast is Australia’s playground. It is home to some of the country’s top amusement parks and has some incredible beaches and scenery. There’s lots to do in the Gold Coast that will keep everyone in your group happy and entertained with Webjet’s holiday packages Gold Coast. The Gold Coast is divided into many different suburbs, each with a completely different feel. Surfers Paradise is like the CBD of the Gold Coast. It’s where you’ll find the most crowds, best nightlife, and some great restaurants and shopping. The beach in Surfers is lined with skyscrapers, giving it a much different feel to the majority of beaches around Australia. It has some cool tourist attractions to check out, including Aquaduck Tours, a 7D cinema, and Infinity—a maze of mirrors, lights, and special effects. Coolangatta is located on the southern end of the Gold Coast. It has a long boardwalk lined with restaurants and things to do. Coolangatta has a great view of the Surfers Paradise skyline, and its beach is a popular spot for surfing. Burleigh Heads is a trendy suburb with a great cafe and restaurant scene. It’s a popular area to stay and has a beautiful beach and coastal park. It’s no surprise that the Gold Coast is full of beautiful coastline. While visiting with Gold Coast holiday packages, there are several nice coastal walks for you to experience. Located in Burleigh Heads, the Burleigh Headlands is a national park with cliff trails located along the water. The walk isn’t challenging and offers great views of the ocean and the Surfers Paradise skyline. For another nice walk, start in Broadbeach and make your way toward Surfers Paradise. You’ll get a beautiful view of the ocean, and the skyscrapers ahead of you are the perfect contrast to the quiet beach. Whether you are travelling with other adults or as a family with children, Gold Coast theme park packages cannot be missed. Each park offers a different experience with fun for all ages. They’re a great entertainment option to go with Gold Coast family holiday packages. Movie World and Dreamworld are full of large, exciting rides. You could easily spend a full day at each without getting bored. Located close by, Wet n Wild is a water park with some amazing water slides and rides. It’s the perfect way to cool off on a hot Gold Coast day. Lines can be long during school holidays, but they move quickly. Just north of the city, SeaWorld is the perfect spot for anyone with an interest in the ocean and marine animals. The park offers a couple of different rides, as well as animal shows, the chance to swim with dolphins, and a ropes course that kids love. Gold Coast theme park packages are available for discount rates when you plan to visit multiple parks. If you love getting out on the water, or have always wanted to try a certain water sport, the Gold Coast is the perfect place to do it. Surfing is a popular option, and there are many surf lessons available to beginners. Alternatively, you could rent a paddle board, kayak, or canoe from many beaches along the Gold Coast. The Tallebudgera Creek just south of the Burleigh Headlands is a great place to try various water sports for the first time. It offers beautiful views and doesn’t have very strong waves. When you picture Gold Coast holiday packages, of course you think of the beautiful coastline that the area is famous for. But head inland into the Hinterland and you’ll get to experience a side of the Gold Coast you might not have even known about. The Hinterland is made up of rainforests and national parks and makes for an easy day trip from the beach suburbs of the Gold Coast. For some incredible hikes and rainforest views, check out the trails and waterfalls of Springbrook National Park and Lamington National Park. For an extra special experience, O’Reilly’s Treetop Walk in Lamington National Park allows you to walk among the treetops and get a great look at the plants and animals that inhabit the rainforest. The park is home to colourful birds, pythons, tree frogs, and koalas. With nice weather most of the year, there really isn’t a bad time to book Gold Coast packages. Spring and autumn tend to be the best seasons with warm weather and little rain. Summer gets hot and humid and can have the occasional unpredictable rain storm. But storms pass quickly, so you won’t have to miss out on too much beach time. Winter temperatures aren’t always warm enough to lay on the beach, but even during winter, you’ll experience pleasant weather with lots of sun, low humidity, and little rain. Be aware that if you book Gold Coast holiday packages between mid-November and early December, it’s when “schoolies” crowds descend upon the area. Prices can increase around this time, and Surfers Paradise experiences large crowds of people who are there to enjoy the nightlife. However, you can still have a relaxing holiday during this time if you stay in one of the other neighbourhoods with Gold Coast package deals, such as Burleigh Heads, Coolangatta, or Currumbin.